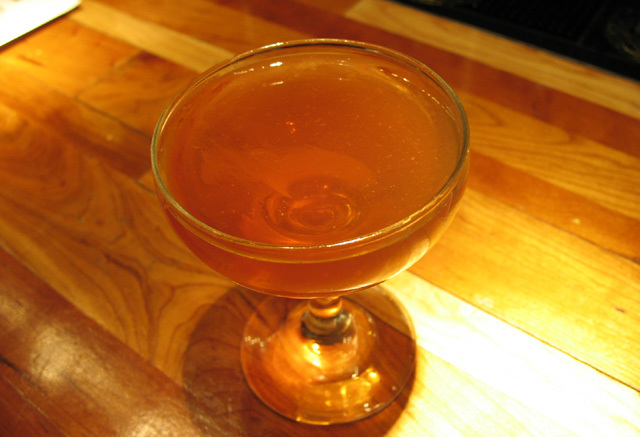 Last Thursday, May 6, was the start of World Cocktail Week, which culminates on May 13 with World Cocktail Day. Thursday was also the debut of Hatchi Mix, a new series of monthly cocktail events at Breadbar Century City. Hatchi Mix is curated by Tasting Kitchen mixologist Devon Espinosa, who dubbed the first night “Vive le Cocktail,” featuring eight classic cocktails for $8 each. Although it wasn’t an official World Cocktail Week kickoff event, the Hatchi Mix launch was a perfect way to celebrate the occasion. By the time I arrived, Hatchi Mix had already been going strong for a few hours. The dining room was full, and the bar was lively but not overly packed. 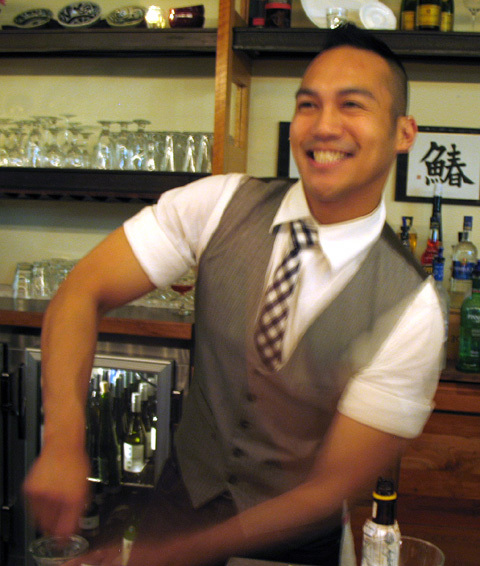 Espinosa and his team were engaging with guests, yet focused and on point when it came to mixing drinks. 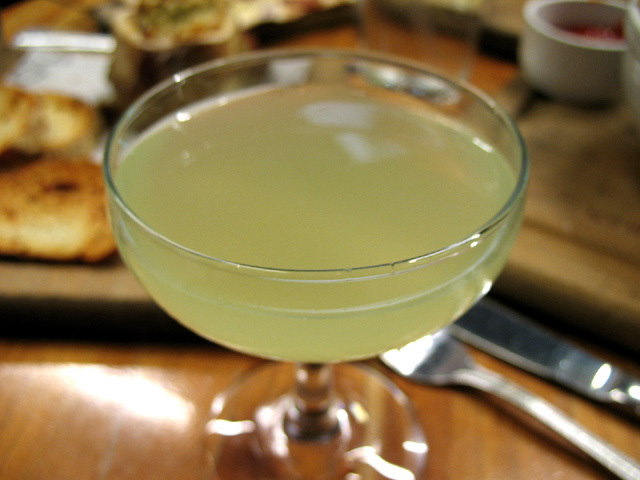 Besides listing the cocktails and their respective ingredients, the Hatchi Mix menu also provided some background as to each drink’s provenance. I started with a Sazerac, made with Rittenhouse Rye Bottled in Bond, absinthe rinse, Angostura Bitters, Peychud’s Bitters, and lemon peel. This might have been the first time I’ve had a Sazerac served in a coupe, but the nontraditional glass certainly didn’t affect the cocktail’s outstanding flavor and balance. I was only a couple of sips in before being joined by my friends Amy and Lena, who each ordered a Hemingway: Bacardi Rum, Maraschino Luxardo, fresh grapefruit and lime juice, served in a highball over ice. I think I tasted one of their drinks, but it’s hard to say since they both enjoyed their Hemingways so much they finished them by the time we were seated on the Breadbar patio. 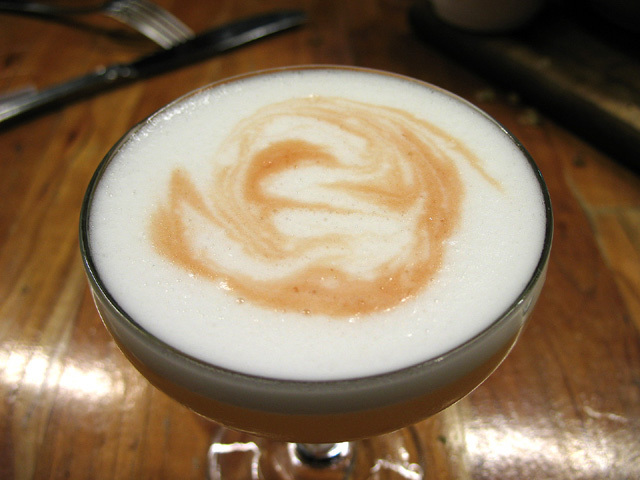 Next up for Lena was a Pisco Sour, made with Peruvian Pisco, egg white, fresh lemon juice, and Angostura Bitters. She passed her cocktail around for us to taste, and we all enthusiastically gave it a thumbs up. For our second round, Amy and I both chose The Last Word: Oxley Gin, Maraschino Luxardo, Green Chartreuse, and fresh lime juice. As with the Sazerac, this was a well mixed, nicely balanced cocktail and one of the better Last Words I’ve had. To soak up the libations, we ordered the bone marrow (one of three Hatchi Mix specials), as well as Breadbar’s thin crust pizza (with cheese, bacon, onions), beer-battered brie sliders, and sweet potato fries. The appetizers were just what we needed, and were uniformly excellent. By now, the bar area was much busier and the noise level inside had ramped up considerably; we were thankful to be outside where it was relatively calm. 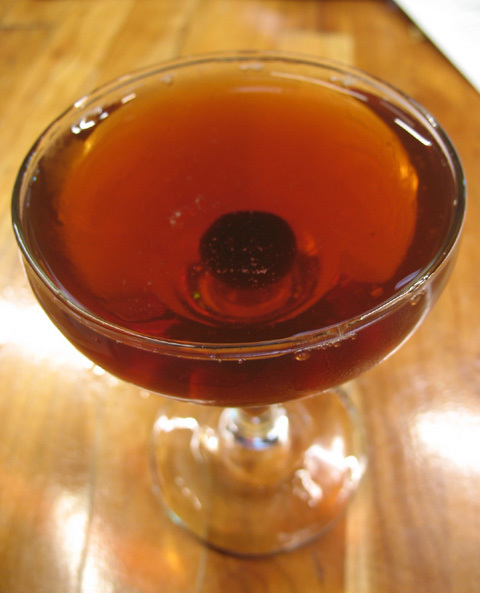 For me, no classic cocktail session would be complete without a Manhattan, and the Hatchi Mix version (Buffalo Trace Bourbon, Carpano Antica, Angostura Bitters, brandied cherry) was top notch. While we didn’t get to try those remaining three cocktails at Hatchi Mix, I have no doubt they’ll be just as good when I finally make my way to Tasting Kitchen. At $8 each, the Hatchi Mix cocktails are quite a bargain, especially considering the high quality of the drinks. That price point is sure to attract cocktail enthusiasts from near and far as Espinosa welcomes some of L.A.’s finest mixologists in the coming months. Hatchi Mix returns to Breadbar Century City on June 3rd with a rum-focused cocktail menu from Joel Black (Caña), followed on July 1st by Julian Cox (Rivera) and his tequila cocktail menu.